The ZITT covers approximately 700,000 hectares in the southern area of the park, equivalent to the core of Yasuní National Park, and part of the territory of the Tagaeri and Taromenane, two indigenous groups that are sub-groups of the Huaorani people and live in the Ecuadorian Amazon region between the Yasuní and Curaray Rivers, sharing the territory with other Huaorani groups. As a reaction to the oil boom of the 1970s and the occupation of their territory by oil exploration blocks over the last 20 years, the Tagaeri-Taromenane sought out isolation deep in the rainforest, and the fact that they have recently become more visible is the result of the expansion of the oil drilling frontier towards the areas where they had found refuge. The creation of the “intangible zone”, which might appear to be a protective measure, effectively left open the possibility of extractive operations in the rest of the park, and in fact this off-limits area inside Yasuní Park is bordered on every side by oil blocks. It should be stressed that the delimitation of the intangible zone was not based on the territory actually occupied by the peoples living in isolation. Moreover, simply putting up warning signs is not enough to stop illegal incursions into the zone, nor does it safeguard the free movement of the peoples living in isolation. The scarcity of resources needed for their survival and environmental contamination – both caused by oil industry activity – are increasingly forcing these people to seek sustenance in other areas. This pressure on their territories has also contributed to the intensification of inter-ethnic conflicts. A particular characteristic of the Tagaeiri and Taromenane in Yasuní Park is the aggressiveness they have repeatedly demonstrated since the beginning of the oil boom towards the outside world and especially the intrusion of outsiders in their territory. However, although there are records of several attacks since the first arrival of oil companies in the area, the situation has worsened in recent years in line with the increased pressure on the territory of these peoples caused by illegal logging, legal oil industry activity, and the expansion of the agricultural frontier. The conflicts generated are associated with the demographic and ideological characteristics of their social structure as hunters-gatherers-farmers culturally related to the Huaorani. These isolated groups are historically characterized by aggressive relations with “non-persons” – cowori in the Wao Tededo language – and war plays a central role in the maintenance of their identity as a group and their territory. In view of these factors, it is very likely that the intrusion and presence of external agents in their territory could spark conflicts, confrontations and attacks. 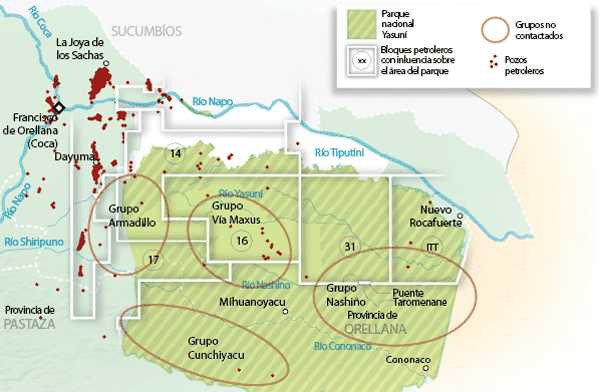 The environmental organization Acción Ecológica maintains that the delimitation of the ZITT was defined “in complicity with the big transnationals that have oil concessions in the Yasuní Biosphere Reserve. These companies have provided maps, information and infrastructure, as well as exerting considerable pressure.” As a result, the borders of the zone reflect the interests of the oil companies and not the movement and settlement patterns of the Tagaeri and Taromenane peoples. The “appearance” of peoples in voluntary isolation in the national legal framework is a challenge for the state. These peoples in isolation reflect the limits of the state’s institutional and legal frameworks and the enormous debt owed by the state in terms of safeguarding their lives and culture. However, a recent decision adopted by the government is aimed in the opposite direction: the administration of President Rafael Correa has decided to abandon its proposal to leave the oil untapped in the pristine area known as Yasuni-ITT. On August 15, Correa announced that that Yasuní would be opened to oil exploration, which additionally represents an increase in threats to the isolated peoples who live there. The decision sparked a wave of national and international protests, and the subsequent repression of young people who demonstrated their support for life and for Yasuní. As usual , the government always protecting and in favor of the people in power, they dont care about the indigenous groups that live there, they only care about the millions they will make with the oil extract and nothing else. no environment protection, no indigenous group being protect. it need to stop before is too late! !